The Marangu route 5 days, also known as the “Coca-Cola” route, is the oldest, most well-established route on Kilimanjaro. This is the only route which offers sleeping huts in dormitory-style accommodations in lieu of camping. There are 60 bunk beds each at Mandara and Kibo Huts, and 120 bunk beds at Horombo Hut. Guests are supplied with mattresses and pillows, but sleeping bags are still required. 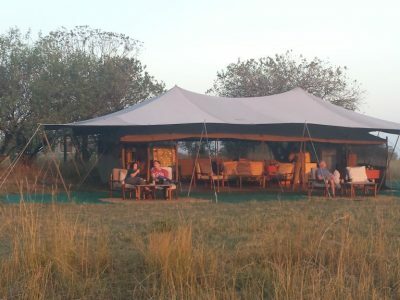 The huts have communal dining halls and basic washrooms, ranging from flushing toilets and running water at the lower huts to long drop toilets and buckets of water at Kibo Hut. Many favor Marangu because it is considered to be the easiest path on the mountain, given its gradual slope and direct path. However, the short time frame of the route makes altitude acclimatization fairly difficult. The route approaches Mount Kilimanjaro from the southeast. Marangu is, unfortunately, less scenic than the other routes because the ascent and descent are along the same path. It is also the most crowded route for that reason. Day 1: Arusha to Mandara Hut. Day 2: Mandara Hut to Horombo Hut. Early morning breakfast and later ascend through the alpine meadow and grassland and moorland to Horombo hut (12,000ft). Both Mawenzi and Kibo peaks can be viewed easily on the way. Dinner and an overnight at Horombo Hut. Day 3: Horombo Hut to Kibo Hut. Have breakfast and further ascend to Kibo hut (15,000ft). The landscape becomes very stony and eroded. Spectacular mountain vegetation like giant cactus, groundswell, and lobelia appear on the way. Dinner and an overnight at Kibo Hut. Day 4: Kibo Hut to Uhuru Peak to Horombo Hut. Wake up at midnight, and after a snack, proceed to the summit through Gilman’s point (18,640ft). It is about 5-6 hours and 1-2 hours from Kibo hut to Gilman’s point and from Gilman’s Point to Uhuru Peak (19,340ft) respectively. You will reach the Mountain peak on the morning of the 5th day and start descending after picture taking on the top to Horombo Hut for dinner and an overnight after a short break at Kibo Hut. Day 5: Horombo Hut to Marangu Gate – Arusha. On our last day, we have a long trek mostly downhill through the tropical rainforest. Once at the park headquarters at Marangu gate, we collect our summit certificates. The waiting car will take you to Moshi / Arusha, for your ongoing travel arrangements. Extra night or acclimatization on the mountain $300 single person. Tanzania Visa: $50 per person on arrival and $100 for U.S. nationals.